On the day of her freshman convocation, Annelisa Cole sat in Fitzpatrick Arena with about 1,500 of her classmates and listened to speakers extoll the benefits of getting involved on the Stanislaus State campus. But even before hearing the message, Cole was ready and willing to fully participate in student life, something she already had been dedicated to during high school. Cole has been involved in student government and campus clubs since the moment she stepped foot on campus. 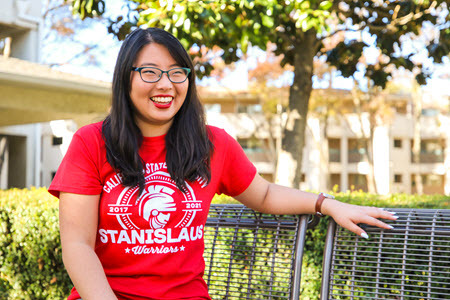 She’s a second-year business administration major and communications minor who has her eyes set on graduating from Stan State next year (completing her bachelor’s degree in just three years.) Already, she’s been the treasurer for Intervarsity Christian Fellowship, ran for an Associated Students, Inc., position, applied for and was accepted as a Student Representative on the University Student Union Board of Directors, served as a student marshal at commencement, was a New Student Orientation leader and was elected president of the Honors Endeavor club. All that while taking a course load of 20 units per semester, six more during summer and winter intersessions, and commuting to school from her home in Riverbank while working in campus housing and residential life. Instead, she counts herself “in,” and she credits her choice to attend a college the size of Stan State as one of the major reasons she’s been able to become so involved on campus. Cole’s desire to be a part of clubs and events on campus certainly has been a driving force in her willingness to be a leader. But she also is aware of one of the great benefits of being an involved student — the chance to network and build relationships with peers on campus who share similar interests. That’s why Cole takes the time to make a difference on campus.